I completely uinderstand. I recently moved to South Carolina and I am drinking more white wine than ever before! (daresay, I even throw in an ice cube here and there) It's just too darn hot out. Once the heat index is over 115 all bets are off! I hear you, Danielle. Great blog, and I look forward to reading more of your work now that you have a job that supports your love of wine. Although the temperature over here is measured in Celsius (and never gets over 90 farenheit anyway) I cannot empathise. However, I can share your like of Picpoul. 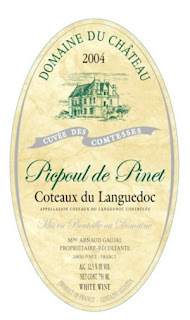 We ate recently at the Wolseley in London and were recommended Picpoul de Pinet to eat with the oysters. I agree it was a perfect match and it was very reasonably priced.